SAN DIEGO–(BUSINESS WIRE)–VOTEC Corporation, an elections professional practice and software developer, has recently added all three major tablet families to the list of platforms available to our customers. VoteSafe is currently in use nationally and is the most comprehensive election day management system on the market. Providing electronic poll books on all Windows 8, Apple, and Android tablets will allow customers the most choices while protecting their software investment should changes in the law require functionality that is only available on some of the platforms. The strength of the VoteSafe product family is its proven poll worker friendliness combined with county wide networking for heretofore unavailable election day communications and control. John Medcalf, VOTEC CEO, knew it was imperative to utilize the latest technology without compromising security. “Although Missouri has recently demonstrated the convenience of tablet check-in, counties were not being offered the security of Windows networking,” said Medcalf. VOTEC decided to emphasize the Windows platform when communications between the polls and election office is required. The Windows platform is noted as being up to a decade ahead of cloud-based products in security planning and cyber attack blocking. Because of recent Apple security breaches, VOTEC is proceeding more cautiously with Apple and Android and will not allow connectivity within VoteSafe during voting hours. “Our Missouri customers are eager to view and experience this new interface. VOTEC is a trusted partner and caution will always be their first consideration. 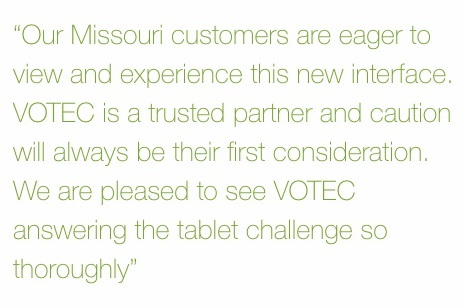 We are pleased to see VOTEC answering the tablet challenge so thoroughly,” said Bill Vanderburg, President and CEO of Adkins and Son Printing, a VOTEC Solutions Partner. VOTEC Corporation has a proven history of providing election solutions for clients across the country for over 30 years, with products designed to specifically address the challenges within elections. VOTEC’s products are produced and supported by a group of former elections officials and elections computer managers. VOTEC’s foundation and primary business is Voter Registration and Election Management with two established and robust software packages designed to both modernize the election process and efficiently manage the voters. VoteSafe™ helps process voters in the precinct with electronic poll books capable of serving as remote election management stations. Administratively, VEMACS is specially designed software that has matured to become the most efficient, flexible, and user friendly Voter Registration and Election Management system available.